MIAMI COUNTY — Watching children smile as they circled around the WACO Historical Society’s hangar area in his handmade barrel train made all the sweat equity worth it for one local Boy Scout. Dylan Warren, 17, of Piqua, donated his time and scouting skills by creating an airplane-themed barrel train for the WACO Historical Society to use during their events. Each barrel features a steering wheel, wings and a propeller to give each child a chance to “fly” during their community events. “When I saw kids on it at the WACO Fly-In, it was a great feeling. They were happy,” Warren said. 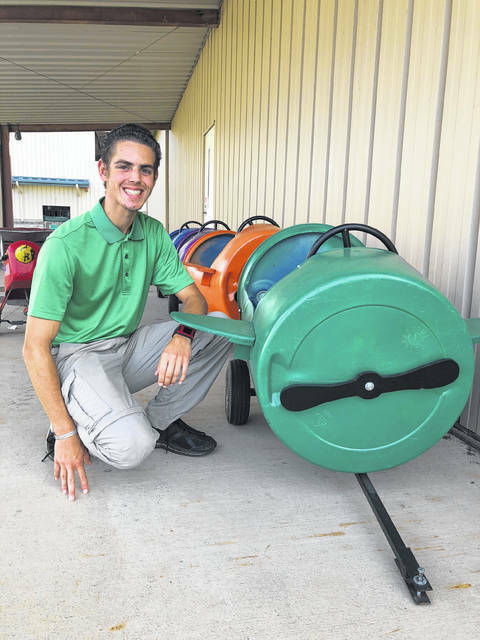 The Piqua High School junior said he knew he wanted to create something for children to enjoy and came up with the barrel train idea. A volunteer at the WACO Historical Society Museum and Airfield, Warren asked the organization if he could donate the airplane-themed barrel train to the organization. With their blessing, Warren began the project, which he built with the help from his fellow troop members, family and friends. Warren said he enjoyed attending WACO events with his grandfather, which led him to volunteer at the museum, including helping with their flight simulator and various other events. Warren, the son Dan and Destinie Warren of Piqua, said he hopes the airplane train will inspire younger attendees to enjoy the WACO Historical Society events in between checking out the historical aircraft and vehicle displays. Warren’s project racked up its first miles during the International Scout event. “It didn’t stop all day,” he said. Warren purchased the barrels from Craigslist, Piqua Steel donated the metal frame, and he put his welding and woodworking skills to work to build the train. Once it was complete, Warren tested the train’s mobility — with the help of family members — prior to donating it to the organization. Warren is a member of Scout Troop No. 344 and is a senior patrol leader. He presented his Eagle Scout project at the Scout Master conference last week and will have a board review next month. Warren plans to pursue a career in computer science and is currently studying cyber security at Edison State Community College. He said he was inspired to complete the Eagle Scout project when he was in Cub Scouts as he watched a Boy Scout achieve the Eagle Scout status. “That always stuck with me. I knew I wanted to go for the Eagle Scout when I was young,” he said. Warren said he learned many life skills as a Scout. “It’s been a great experience. I learned a lot about leadership and public speaking. 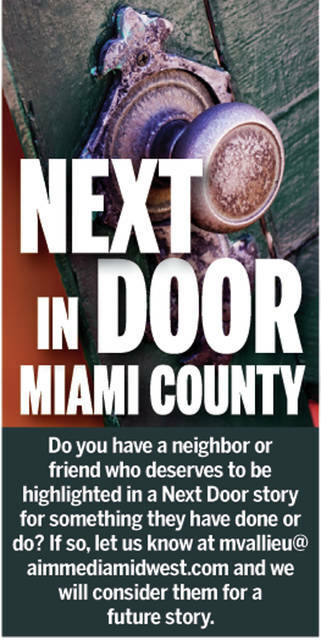 I can get up in front of a group to help lead and delegate from Scouts,” he said. Warren said other enjoyable memories include participating in many scouting trips, including a 12-day backpacking trip in New Mexico and a 75-mile canoe trip in Canada. “I hope this project inspires someone else to keep it going,” said Warren, who said his favorite merit badges earned were in computer animation and climbing.